Indian Council for UN Relations (ICUNR) hosted an event to celebrate International Women's Day at Le Meridien, at New Delhi on the 3rd of March, 2019. It was an event amongst some of the delegated members of India namely, Shabana Azmi (Bollywood Super Star and Social Activist, Leher Sethi, the Secretart and Co-ordinator of ICUNR and Major Gagandeep Bakshi. Kairali Ayurvedic Center is a day-care treatment centre, located at different parts of India and abroad. It is one of the core divisions of Kairali Ayurvedic Group, that was established in the year 1908, under the aegis of expert disciplinarians. The first Ayurvedic centre by Kairali was opened in New Delhi in 1989. Following which numerous Ayurvedic treatment centres were established. The event held on 3rd of March, 2019, on International Women's Day, brought in a lot of discussions among the panelists namely, Ash Devi, Deepika Krishna, Leher Sethi, Shabana Azmi, Yogita Bhayana and Dr. Udit Raj. This discussion had brought in various mainstream issues that has been debated ever since the time of independence, and that is Women Empowerment. Women is always considered as a symbol of beauty and elegance. This is a conventional theory that people has been following since ages, even though the contemporary times has given us different dimensions of women. Hats Off to all those women who symbolizes the true passion and competence to stand equal with everyone. The status of women in society has changed and now we see women leading the world with their intelligence and skill and that too in a prosperous way. This International Women's Day, on the 8th of March, 2019, brings in special discount offers that appreciates and celebrates the joy of womanhood. Kairali Ayurvedic Center, a day-care treatment center of a 100-year-old Ayurvedic Company, Kairali Ayurvedic Group, introduces a special Women's Day Package for all the beautiful women as a gesture of love and appreciation. 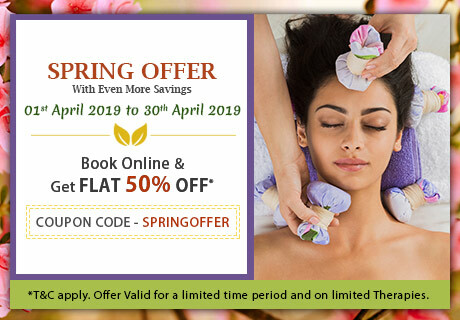 This discount offer is valid in some of the centers of India and Bangkok from the 5th of March, 2019 to 31st of March, 2019 and can be availaed through the coupon code WOMEN08. Ayurvedic therapies are clubbed in this package that are offered at an introductory price. The authentic Ayurvedic treatments and therapies that Kairali provides are completely natural and are inspired by Ayurveda. Abhyangam, an Ayurvedic full-body massage, Shirodhara, an Ayurvedic anti-stress therapy and Kaya Lepam, an Ayurvedic facial for glowing skin are the three Ayurvedic therapies that are available at a discounted price in India. Whereas, in Bangkok, Abhyangam, Shirodhara and Ayurveda Glow Facial are available. Kairali Ayurvedic Center has brought in an amazing way to celebrate this Women's Day and gift your lovely women with this Ayurvedic offer and make them feel pampered and special. Delhi, Gurgaon, Faridabad, Mumbai, Hyderabad (Both), Patna, Raipur and Siliguri. 2. This offer is not valid on Wellness Packages/Kairali Membership/Treatment Packages. 3. Appointment to be scheduled minimum 24 hours prior to the date of service. 4. This offer cannot be clubbed or combined with any other voucher or discount offers. 5. This offer can be used to avail services at a single setting and applicable only on combination of Abhyangam, Shirodhara and Kaya Lepam. 6. Extra services availed would be charged as per actuals. How thoughtful and happy we feel during the season of festivities. Kairali Ayurvedic Center too wants to share some happiness with everyone this Christmas and New Year and spread love and gratitude. This treatment center, first established in New Delhi, 1989, has been a symbol of true Ayurveda that delivers authentic Ayurvedic services. Facilitated with world's best Ayurvedic treatments and therapies that are given by professional therapists provides for an exquisite experience that can always be awaited for. Kairali Center brings in Christmas and New Year offer to make this festive season a special and a happy one. This offer on Ayurvedic treatments is valid from 15th of December, 2018 to 6th of January, 2019 wherein flat 50% discount will be given to those who book online. Make this festive season a memorable one by allowing yourself feel completely relaxed, rejuvenated and detoxified. Visiting Kairali Ayurvedic Center's official website and by using the coupon code: NEWYEAR50, make this new year a year filled with positivity and happiness. The treatment center is a day-care centre where professional Ayurvedic doctor and physician are available for consultation and accordingly treatments can be taken. The hospitality and hygiene of Kairali have met the standards of recognition due to which it has been praised and accredited. Ayurveda as an ancient entity has revealed numerous dimensions of living a healthy and stress-free life that has benefited the human race to a considerable extent. Life led on Ayurvedic terms helps to increase the longevity and enhance the quality of life. It has rather become very necessary to make a life pattern that would be effective and helpful in the long run to keep us fit and healthy. The better the ways of living are, the better the quality of life one gets. Kairali Ayurvedic Group is one such example in this regard that has dedicated their life from the past 100 years to create a world inspired by Ayurveda. It is a well-known Ayurvedic brand that has withstood the test of time and is still continuing to inspire people to lead an Ayurvedic lifestyle through their various health and wellness techniques. Kairali Ayurvedic Center, an integral division of the Group, established first in New Delhi in the year 1989 is set with a motive to provide therapeutic healing techniques and authentic Ayurvedic massages. This day-care treatment centre is facilitated with professional therapists and Ayurvedic doctors for consultation. This year, this wellness centre has won the FICCI Medical Value Travel Award for being the Best Wellness Centre. The award was organised by FICCI (Federation of Indian Chambers of Commerce and Industry) to appraise all the noted healthcare brands and recognize the exceptional services of hospitals, Ayurvedic centres, wellness centres and medical facilitators. This award ceremony was held at Indian Expo Centre and Mart in Greater Noida, Delhi, NCR. Kairali is truly synonymous to Ayurveda and has been proving itself from time to time by improving the medical facilities as well as the best of Ayurvedic treatments. Numerous curative therapies like Abhyangam, Shirodhara, Podikizhi, Kadikizhi and lots more are provided by this centre. With time it has established more than 25 Ayurvedic centres both in India and in abroad. Panchakarma, as we all know is a detoxification process to help the body release all the toxins and imbibe within itself healthy and fresh ways of cleansing, was first available in the New Delhi Centre and also has been awarded as the First Panchakarma Clinic in India. Hence, with great pride and honour, Kairali Ayurvedic Centre received the award for being the best Ayurvedic wellness centre.